Andy Warhol was often blamed for Edie Sedgwick's descent into drug addiction and mental illness. However, before meeting Warhol, Edie had been in mental hospitals twice and came from a family with a history of mental illness. She was only part of the Factory for about a year, from approximately March 1965 to February 1966. Another fallacy was that Warhol ditched Edie after using her up whereas the truth was that it was Edie's decision to leave the Factory, lured by promises of stardom by Bob Dylan and his manager, leaving Andy feeling slightly betrayed. They eventually had a total of 8 children: Alice (Saucie) in 1931, Robert Minturn (Bobby) in 1933, Pamela in 1935, Francis Minturn (Minty) in 1938, Jonathan in 1939, Katharine (Kate) in 1941, Edith Minturn (Edie) in 1943, and Susanna (Suky) in 1945. Edie Sedgwick's family ancestry originated from Stockbridge, Massachusetts where Edie's great-great-great grandfather had moved after the Revolution. Judge Theodore Sedgwick (1746-1813) had been Speaker of the House of Representatives in the time of Alexander Hamilton and George Washington and had also been the Chief Justice of the Supreme Judicial Court of Massachusetts. His wife, Pamela Dwight (1753-1807) had gone insane "halfway through her life." (EDIE3) Stockbridge had closer ties to New York than Boston, with many of her family ancestors pursuing careers in New York after being educated at Harvard. Edie was first institutionalized in the autumn of 1962 after suffering from anorexia and, like her brother, attended the Silver Hill mental hospital. Her anorexia continued until she weighed only ninety pounds at which time she was transferred to Bloomingdale, the Westchester Division of New York Hospital. (EDIE115) Whereas Silver Hill was fairly liberal, Bloomingdale was very strict. Near the end of her stay there, she became pregnant while on a hospital pass and had to have an abortion. (EDIE115/7). After her release from the hospital, she moved to Cambridge in the autumn of 1963 and continued to see a psychiatrist. There she met Chuck Wein, who according to a friend at the time, Ed Hennessy, "had graduated a year or two before, but he had come back to bum around." (EDIE126) She prospered socially, hanging out with people like Hennessy - "a kind of deliberately outrageous dandy at a time Harvard was not producing many dandies" (EDIE126). In January 1965, Edie met Andy Warhol at Lester Persky's apartment. She began going to the Factory regularly in March with Chuck Wein. During one of these visits, Andy put her into Vinyl, at the last minute." (L&D219-20) She had previously made a very short appearance in Warhol's film, Horse, when she and Ondine entered the Factory toward the end of the film. Bob Dylan and Bobby Neuwirth first met Edie in December of 1964 - approximately a month before she met Warhol. Neuwirth had first met Dylan at the beginning of May 1961 at the Indian Neck Folk Festival in Connecticut. In February 1964 Neuwirth joined Dylan on the road as a go-fer and became his "right-hand man." At the time that Neuwirth and Dylan met Edie, Dylan was staying in Room 211 at The Chelsea Hotel with his future wife, Sara Lownds, and her 3 year old child from a previous marriage. While Sara stayed in the hotel taking care of her child, Neuwirth and Dylan enjoyed New York's nightlife. The Kettle of Fish was one of their regular haunts. Dylan was also having an affair with Joan Baez which had begun in May 1963 after both performed at the Monterey Jazz Festival. The relationship with Baez continued until May 1965 when Baez broke up with Dylan after discovering him and Lownds together in Dylan's hotel room during a concert tour of Great Britain. Dylan had previously neglected to tell Baez about Lownds. In November 1965, Dylan married Sara in a secret ceremony - something that Edie apparently found out from Warhol during an argument at the Gingerman Restaurant in February 1966. There is no evidence that Edie ever had a sexual relationship with Bob Dylan. However, she did have one with Bob Neuwirth. Bob Dylan's album Blonde on Blonde was released on May 16, 1966. 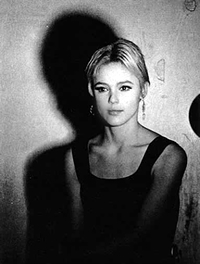 One of the women featured on the inner sleeve was Edie Sedgwick. Some of the songs were rumored to be about Edie. Nico thought that Dylan might have been referring to Edie in the song, Leopard-Skin Pill-Box Hat, which was included on the album. Some claimed that the phrase "your debutante" referred to Edie on the track, Stuck Inside of Mobile With the Memphis Blues Again. It was also rumored that Just Like a Woman was about Edie. The non-Warhol film that Edie made after she left the Factory, Ciao Manhattan, had Just Like a Woman as part of its soundtrack. Some Dylan biographers, however, think that the song was probably about Dylan's relationship with Joan Baez. The supposed film with Dylan never materialized although D.A. Pennebaker, who filmed the documentary Don't Look Back in 1965, recalled that he also shot "a lot" of footage of Edie who was often at his studio. Don't Look Back covered Dylan's concert dates in England from April 30 - May 10, 1965. The following year Pennebaker was also hired by Dylan as the cinematographer for a film for television broadcast that Dylan wanted to produce himself called Eat the Document. Bobby Neuwirth helped Pennebaker edit the 1966 footage. After leaving Andy's crowd, Edie, still in a relationship with Bob Neuwirth, tried modeling, appearing in Vogue on March 15, 1966. During her Factory days, she had appeared in Vogue in August 1965 as a "youthquaker" and also in a fashion layout for Life magazine in the September 1965 issue. She never became part of "the family at Vogue" because, according to senior editor Gloria Schiff: "she was identified in the gossip columns with the drug scene, and back then there was a certain apprehension about being involved in that scene... people were really terrified by it... drugs had done so much damage to young, creative, brilliant people that we were just anti that scene as a policy". (EDIE302). 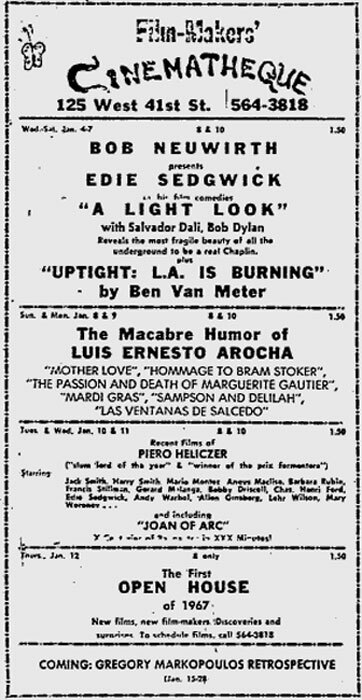 Edie also auditioned for Norman Mailer's play The Deer Park, but Mailer thought she "wasn't very good... She used so much of herself with every line that we knew she'd be immolated after three performances" (EDIE314). The shooting for Edie's final film, Ciao! Manhattan, started on Easter Sunday, 1967. Soon afterwards, suffering from the DT's, Edie was admitted to the same clinic they used to film the shock treatment in Ciao Manhattan, where she had real shock treatments. Edie married Michael Post on July 24, 1971. She stopped drinking and taking pills until October when pain medication was given to her to treat a physical illness. She remained under the care of Dr. Mercer who prescribed her barbiturates but she would often demand more pills or say she had lost them in order to get more, often combining them with alcohol. On the night of November 15, 1971, Edie went to fashion show at Santa Barbara Museum, a segment of which was filmed for the television show An American Family, Lance Loud had already met Edie before on a beach in Isla Vista and she spoke to him in the lobby "drawn" by the cameras. After the fashion show Edie attended a party and was verbally attacked by one of the guests who called her a heroin addict. The guest was so loud that she was asked to leave. Edie rang Michael who arrived at the party and could see that Edie had been drinking. Eventually, they left the party, went back to their apartment where Michael gave Edie the medication that had been prescribed for her and they both fell asleep. When Michael woke up the following morning at 7:30, Edie was dead. The coroner registered her death as Accident/Suicide due to a Barbiturate overdose.